In the last days of the season, Alexander Andreev tried to do a few stunts on the stock GSXR1300 Hayabusa just for fun. The experiment is interesting, considering that the motorcycle has a long base, weighs a lot, and it has a small driven sprocket. He didn't have a right for a mistake (the bike has a poor protection), so it was impossible to properly feel out the bike. Alexander did all the stunts safely. As soon as the forward flask warmed up, there were some good stoppies, even with a 90 degree turn. 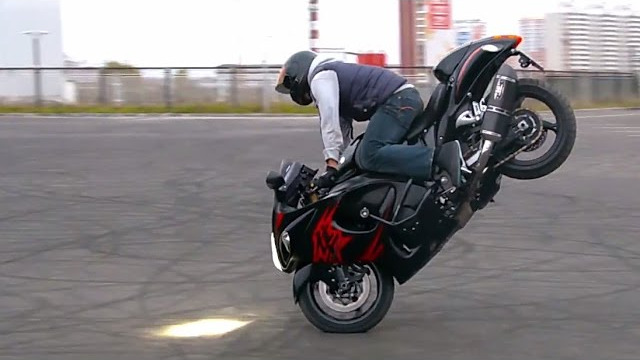 Alexander Andreev: "On the right tires, it is quite possible to so long stoppies, even 180 ones. Wheelies had to be done carefully, not to touch the mufflers and wings. Tourist tires of 190th size would fit perfectly. It is easy to pull up the bike. It would be interesting to check its stability by doing slow wheelies but it should be rebuilt for that. Burnouts were easy to do. I didn't even have to shoft my weight forward - the wheel drifted even with a passenger." Watch some of the stunts in the video down below!